What will your entry be, Wacky? Scary? Cute? 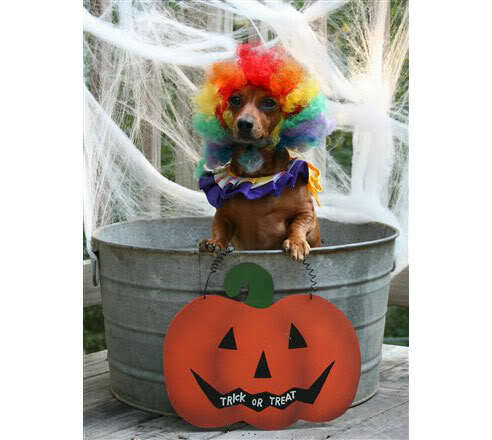 Show off your child, grandchild, family, friends, or your pets this Halloween. We want to see your costumes and you can win a prize too. Friend us on Facebook, and tag us in your picture, or post to our Flickr page. We will be accepting pictures till November 6th. 1st Place will win a $50 gift card to Zona Rosa shopping center to start off there holiday shopping, 2nd Place winner will recieve a Free "Works" Package to Thoroughbred Ford. Have a Happy Halloween! Electric Vehicles will bring about new ways of refueling. Instead of gassing up, customers will plug in, and Ford is working with its supplier partner, Yazaki, to make this a natural and comfortable experience. The two companies used internal ergonomic studies to design the convenience cord, drawing inspiration from hockey sticks, curling irons and tennis racket handles. 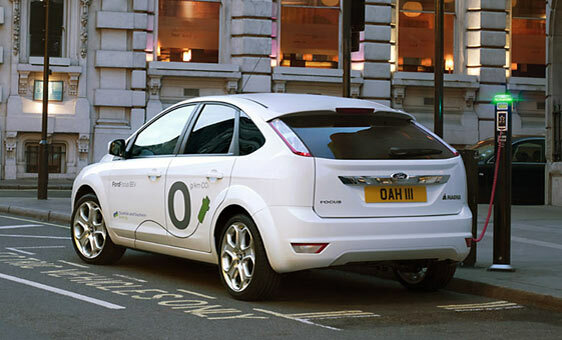 While most owners are expected to recharge the zero-emissions, gas-free Focus Electric at home with an optional wall-mounted 240V charging station, they also will have the ability to recharge at remote locations with a standard 120V convenience cord. 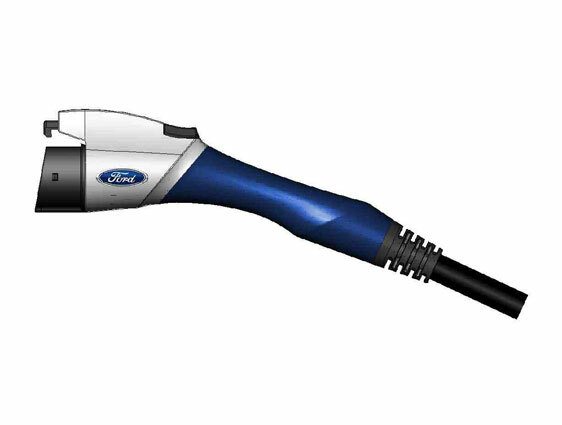 Both types of connectors will use an industry-standard five-point plug fitted with an ergonomic Ford-branded handle specially designed for comfort and durable daily use. Owners of Focus Electric will recharge the car’s onboard lithium-ion battery pack by plugging the convenience plug or charge station plug into the vehicle’s charge port. The Ford Focus Electric, which debuts in late 2011, will bring enhanced recharging flexibility with a 120V convenience cord to allow users to recharge the all-electric vehicle at remote locations; the convenience cord will serve as a backup to an optional 240V home charging station. Focus Electric is one of five new electric vehicles Ford will deliver over the next three years in North America and Europe; it will be built at the Ford Michigan Assembly Plant. Ford supplier partner Yazaki conducted extensive and durability tests on Focus Electric’s cord set connector, including an insertion/extraction study of 10,000 cycles to assess the durability of the interaction between the handle and plug. For every thousand insertions, testers dunked the plug into a sandy salt water solution to add grit to the connectors and they repeatedly dropped the handle and rolled over it with a car tire to test its durability. Testers also subjected the cord set connector to ambient extreme temperature increases. We make it easy for you to share this story with your friends; simply click on the “share this” method of your choice just below or at the top right corner of this page. You can also click here to sign up for updates from Ford Motor Company, and click here to add an RSS feed to your regular homepage. You asked, and Ford Motor Company answered: 70 percent of F-150 customers said better fuel economy is what they’d like improved most in their truck. 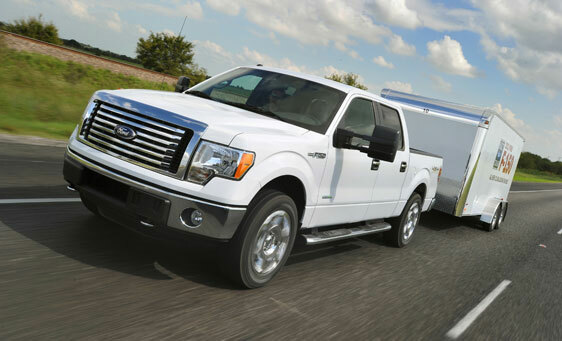 And that they got – the 2011 Ford F-150 is projected to be the most fuel-efficient full-size pickup of any manufacturer, thanks to a projected 23 mpg highway (pending final EPA certification) with the new 3.7-liter engine. The new 5.0-liter V8 engine is projected to deliver 21 mpg highway, pending EPA certification. The new 3.7-liter V6 is projected to deliver 16 mpg city and 23 mpg highway in 4×2 configuration. Projections for the new 5.0-liter V8 are 15 mpg city and 21 mpg highway in 4×2 configuration. No manufacturer offers better fuel economy numbers in these respective segments. Also new for 2011 are the 6.2-liter V8 and 3.5-liter EcoBoost™. The EcoBoost will be available in early 2011; trucks with the 3.7-liter V6, 5.0-liter V8 and 6.2-liter V8 will arrive in dealer showrooms later this year. The new V6 and V8 make up half of an all-new powertrain lineup for the 2011 Ford F-150, part of the most extensive engine makeover in the 62-year history of F-Series. This versatile new powertrain lineup enables F-150 customers to choose the engine that best suits their needs. Each engine is mated to a fuel-saving 6R80 six-speed automatic transmission, which has SelectShift capability with progressive range select and manual mode for the first time. Ford is the only manufacturer to equip its entire full-size pickup lineup with six-speed gearboxes as standard. A one-way clutch, which allows for smoother 1-2 and 2-1 shifts, faster downshifts and improved fuel economy, also has been added. The gear ratios, span and shift schedule have been optimized for better off-the-line performance and improved fuel economy. The double-overdrive gear also provides better fuel economy. The 6.2-liter V8 is a premium engine offering on the 2011 F-150. It is now standard on F-150 SVT Raptor, with expanded offering on other specialty applications. A premium powertrain offering available after launch, the 3.5-liter EcoBoost has more torque than any competitors’ V8 with the fuel economy of a smaller-displacement engine. This EcoBoost engine will establish a new benchmark for its combination of performance capability and fuel efficiency. If you have been looking for a new place to treat yourself or your family and friends, try out the newly opened Yogurtini in Zona Rosa, Next to Dillards. Yogurtini is a self service frozen yogurt shop. With 10-16 different flavors served daily, and 65 different toppings giving you an endless possibility of flavor. The frozen treat is made with real non fat yogurt you pay by the ounce. 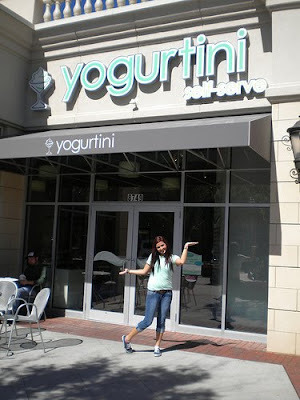 So if your up near Zona Rosa and in the mood for something sweet, drop in and make your own serve-'yo'-self frozen creation.Check them out on their website click on the Yogurtini logo, as well as they are on Facebook and Twitter. Hands-free is where it’s at—or should that be, where it’s app? Ford has started to release its Software Development Kit (SDK) to the next round of developers so that they can modify existing smartphone apps for voice command and control through the Ford SYNC voice recognition system. “What we see emerging as we explore new ways to safely enhance connectivity and reinvent the driving experience is a mutually beneficial ‘collaborative community’ where our shared customer – anyone who drives a car and owns a smartphone – is the true beneficiary,” said Derrick Kuzak, Ford group vice president of Global Product Development. 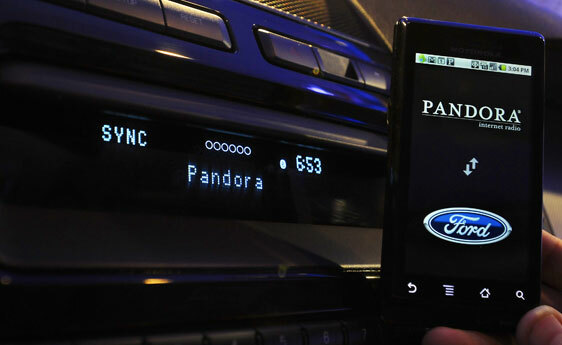 Ford is reviewing more than 1,000 submissions made on the SYNC Developer website for future SDK release. 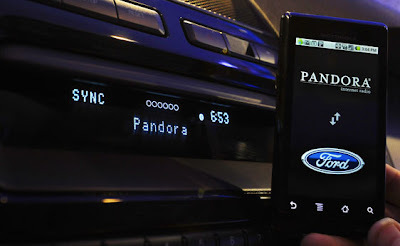 The release marks the latest move by Ford to forge a more open collaborative bond with the wireless, consumer electronics and app developer communities to create a safer and smarter in-car connectivity experience. The first app partners include Pandora Internet radio, Stitcher smart radio, and Orangatame’s OpenBeak, with more to be announced soon. Further down the road, Ford will also examine the potential of apps that can provide exciting new levels of safety knowledge as well as improvements in driver productivity and convenience. Ford is in the process of evaluating the potential of existing apps for in-car use, including categories for finance, such as alerts about stock price drops and drive-by payments, location-based services like navigation, traffic and business searches, and scheduling and planning, such as when flights are delayed or rescheduled. When the all-new 2012 Ford Focus arrives on dealer showrooms, it will offer an exclusive suite of innovative airbags that help customize protection in the most common frontal and side crashes. 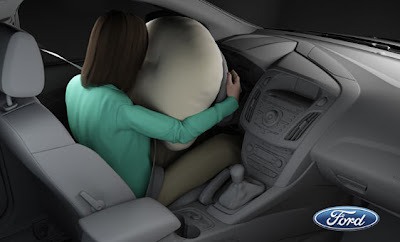 Specifically, Ford is introducing next-generation driver-side, front passenger and side airbags. The suite of new innovations includes next-generation driver-side airbag with enhanced chest protection technology. The new airbag uses a reconfigured curve-shaped tether system that pulls in the lower section to create a pocket to help lessen the impact of the airbag on the driver’s chest and ribs in frontal crashes. Click here to watch a video that demonstrates the new airbag design. Side airbags feature unique shoulder vents that stay open and reduce pressure for smaller occupants who typically benefit from reduced forces. Taller occupants whose shoulders block the vent could benefit from the higher pressures. Focus also will be the first Ford car ever to feature front passenger airbags with adaptive venting technology that diverts some of the gas from the airbag inflators through vents outside of the airbags. The restraints control module – the control center of the Ford advanced safety systems – adjusts the level of venting based on seat position. The new passenger airbag is designed to help enhance head and neck protection by better matching deployment force with occupant size. This system uses a small pyrotechnic device to force open the vent and can provide less pressure in the airbag when it’s sufficient to help protect the occupant. The next-generation airbags will debut as standard equipment on the all-new Ford Focus on sale early in 2011 in North America. The new airbags will roll out on other Ford vehicles in the next few years. In addition to the new airbags, the vehicle structure of the new Focus provides enhanced crash protection as well as improved vehicle dynamics. High-strength steels comprise 55 percent of the body shell, and ultra-high-strength and boron steels make up more than 31 percent of its skeletal structure. These advanced materials help the structure meet crash regulations across world markets, while minimizing the vehicle’s weight to help maximize fuel economy. Ford was the first automaker to begin airbag research five decades ago. It fielded an airbag test fleet in 1971, offered a driver-side airbag in 1985 and standardized driver and front passenger airbags in most vehicles by 1993. In recent years, Ford has introduced a variety of crash protection systems – ranging from canopy airbags to knee bolsters – designed to improve occupant protection. Ford has the most Top Safety Picks from the Insurance Institute for Highway Safety of any automaker. DEARBORN, Mich., Oct. 1, 2010 – Consumer demand for Ford’s fresh lineup of high-quality, fuel-efficient vehicles in September helped the company continue to grow both sales and retail market share. Ford, Lincoln and Mercury sales in September totaled 160,873, up 46 percent versus a year ago. Ford’s market share also increased in September, marking the 23rd time in the last 24 months that Ford’s share of the retail market increased. Ford’s Newest ProductsThe Ford Edge and Lincoln MKX crossovers, the company’s latest new products to arrive in dealerships, are the first to offer MyFordTouch and MyLincolnTouch, respectively – state-of-the-art technology to better connect drivers with their vehicle information, entertainment and on-board technologies. The new Ford Edge features best-in-class horsepower and unsurpassed V6 highway fuel economy. The new Lincoln MKX offers best-in-class fuel economy and 305 horsepower – an increase of 40 hp versus the prior model. Sales for the Ford Edge in September totaled 12,815, a record for the month and up 186 percent versus a year ago. Sales for the Lincoln MKX totaled 2,658, the highest sales month in over two years and up 76 percent versus a year ago. The pace of sales for the all-new Fiesta accelerated in the second half of the month as availability at Ford dealers began to improve. September sales for the highly acclaimed subcompact totaled 3,050. Fiesta’s conquest rate is 57 percent – the highest of any Ford product. Another global product star – the Ford Transit Connect, a small, purpose-built van – launched in North America last summer. In September, this new vehicle aimed at small businesses posted its highest-ever sales month of 3,571. For 2011, F-150 further ensures its leadership with an all-new powertrain lineup of four new engines, including a 3.5-liter EcoBoost, and a new six-speed transmission that will deliver class-leading capability and fuel economy. This truck lineup will be 20 percent more fuel efficient than the 2010 models. F-150 pickups with the new 3.7-liter V6, 5.0-liter V8 and 6.2-liter V8 will be in dealership showrooms later this fall. The F-150 with EcoBoost will be available for sale early next year. About Ford Motor CompanyFord Motor Company, a global automotive industry leader based in Dearborn, Mich., manufactures or distributes automobiles across six continents. With about 159,000 employees and about 70 plants worldwide, the company’s automotive brands include Ford, Lincoln and Mercury, production of which has been announced by the company to be ending in the fourth quarter of 2010. The company provides financial services through Ford Motor Credit Company. For more information regarding Ford’s products, please visit http://www.ford.com/. 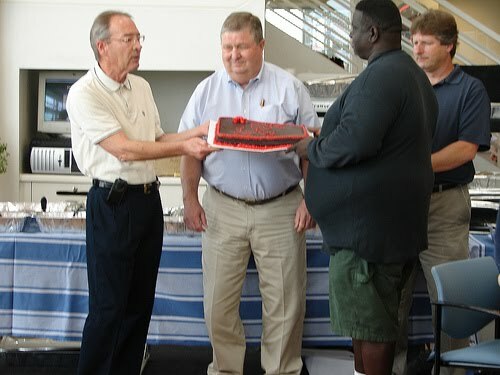 Congratulations Leroy Adams, the Inventory Manager here at Thoroughbred Ford. He has been with this company for 50 years. 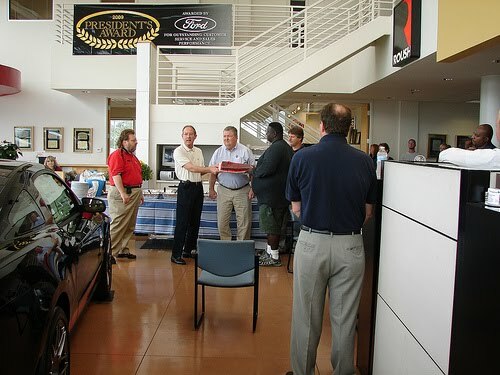 For 24 years under the name Bob Schneider Ford, and for the last 26 years been with Thoroughbred Ford. 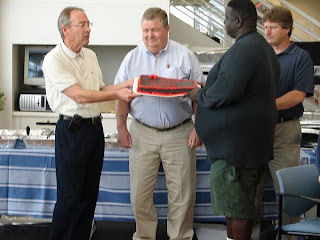 We all gathered to support him for his service with Ford, with cake and barbeque. Thanks for hard work and the barbeque Leroy! !